For decks with cracking, spalling, and scaling, resurfacing is an effective solution. A concrete overlay or coating can be installed on top of the worn out deck to cover up any signs of crack filling and any other blemishes that make the surface unsightly. The great thing about resurfacing is that it restores the existing pool deck while improving its form and function. 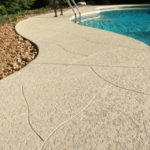 The most popular resurfacing methods for pool decks are concrete stamping and spray knockdown texture. Both of these overlays provide slip-resistance that makes the deck a lot safer to walk on even when wet. Refinishing is highly recommended for pool decks that have superficial issues, such as ugly stains and discolored areas. Discoloration is often caused by the weather changes the deck is exposed to daily. Pool chemicals can also discolor the pool deck. The most common solution is concrete staining. There are many other coloring options available but stains are the most reliable. Acid and water-based stains penetrate deep into the slab, making it difficult for the color to fade away, flake, or chip off. 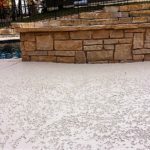 This can be done directly on a sound slab and it can also be used as an additional customizing process to a resurfaced pool deck. Working cracks are cracks that recur regardless of how efficient the filling agent is. Such cracks are often caused by moving subgrade or water underneath the slab. No amount of filling could put an end to the reappearance of cracks. The best way to work around this is to disguise the cracks through custom engraving or scoring. It makes the crack look like it is part of the deck’s design while giving it enough room to move without creating new cracks.